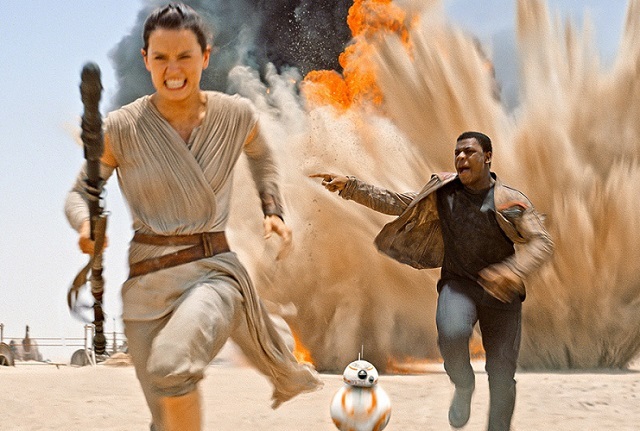 Star Wars: The Force Awakens is really good. If that’s the first thing you’re worried about, relax. Even if you searched your feelings and knew that this new movie couldn’t possibly be as bad as the three prequels, let go of that fear. Besides, you remember what fear leads to. If the second thing you’re worried about is this review spoiling anything, you will feel no such disturbance in the Force here. I’ve avoided all reviews of The Force Awakens myself, afraid to have anything revealed before I could see the story play out on screen. I know how disappointed I would be if I had any plot or character points ruined by reading about them first. I’m trying to write the review I would have wanted to read before seeing the movie. So consider this a safe place. You know what’s also been a safe place whether you realized it or not? All those trailers and TV spots that you first consumed with glee, but then tried to avoid because you thought too much would be given away. It will amaze you how much is not revealed in all of the promotional material you’ve seen. We know that director J.J. Abrams, Mr. Mystery Box, is fiercely protective of his material and disdainful of spoilers, determined to protect fans from their own worst impulses. There are so many surprises — both from a visual and story standpoint — waiting for you. And even if you suspected anything that occurs, it’s still a delight to see those events unfold. This is the Star Wars movie you’ve been wanting to see for at least 10 years (Actually, more like 30-plus years, going back to Return of the Jedi.) Abrams and co-writer Lawrence Kasdan (along with Michael Arndt, who still has a writing credit based on his first script) have created the perfect balance of paying tribute to the original films that we loved so much while still creating something that feels fresh and exciting. Nitpickers might say that the story here isn’t truly new, and after you see The Force Awakens, you’ll probably know what that means. But I would prefer to say that Abrams remembers what makes a good Star Wars film, and hitting those familiar beats feels incredibly satisfying. One thing that felt new to me was that The Force Awakens is a war movie. Sure, the original Star Wars trilogy told a story of the war between the Empire and the Rebel Alliance. But George Lucas was also building a universe and taking his characters on the archetypal hero’s journey. Yes, there was space warfare, so cool that it launched generations of children annoying their parents by flying toys and making spaceship noises throughout their homes. Yet it also felt clean and somewhat light, like a fantasy. Abrams and cinematographer Dan Mindel actually depict two military forces — the First Order and the Resistance — in combat. Obviously, advances in digital effects can give action more weight and make it seem more real nowadays. And no one does that better than the wizards at Industrial Light & Magic. But the battles that take place in the skies and on the ground here feel so much more real. It’s not all shiny and sleek. There is a grit to those scenes. The camera moves with the Tie Fighters and X-Wing Fighters, zooming in and out of the action. The screen isn’t flooded with a bunch of extra digital clutter, but focused on what’s most important. Characters sweat and bleed and fight among smoking rubble. It feels like these people are truly in jeopardy. Among those characters are four new faces that could eventually become as memorable as the ones we’ve grown to love. Oscar Issac’s Poe Dameron is the role Harrison Ford would have played had this movie come out in the late 1970s. Many movie fans already know how talented Isaac is. He’s arguably the best actor of this generation, showing an impressive versatility through movies like Drive, Inside Llewyn Davis and Ex Machina. We’ve haven’t previously seen him play the action hero, the guy that kids want to be when they’re acting out their favorite movies. But Isaac fills that role nicely, living up to the fabled billing that the story gives him as the Resistance’s best pilot. In many ways, John Boyega’s Finn is the most exciting character because he’s something we haven’t seen before in the Star Wars mythology. In the previous films, the Stormtroopers were faceless minions, virtual automatons meant to be gunned down by our heroes. But for the first time, we see one of the people under that iconic helmet. Abrams and Kasdan either chose to ignore the prequels establishing the Stormtroopers as clones or the First Order has moved past that in this new story. But by attempting to convert actual people into soldiers, the First Order risks having some of those fighters fight that conditioning and show a mind of their own. Finn wants to do what he believes is right; he’s just not sure that he can. 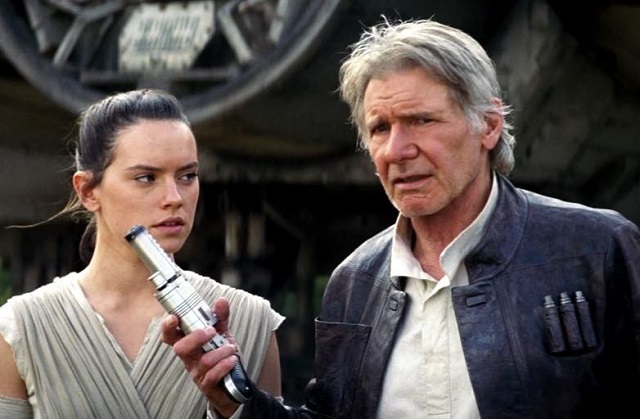 But the true hero of The Force Awakens, as you surely guessed, is Daisy Ridley’s Rey. She lives a solitary life as a scavenger on the desert planet of Jakku, literally surviving on the scraps she finds and is given. The stories we’re familiar with are myths to her, something to explain the ruins she explores and lives in. Deep down, Rey believes — or at least she hopes that she’s meant for something greater, though such an opportunity has never presented itself. Eventually, however, circumstances find her and engulf her in the conflict between the First Order and Resistance. Maybe Rey was always meant to be a part of it, like Luke Skywalker before her. Most everyone she encounters seems to recognize that. 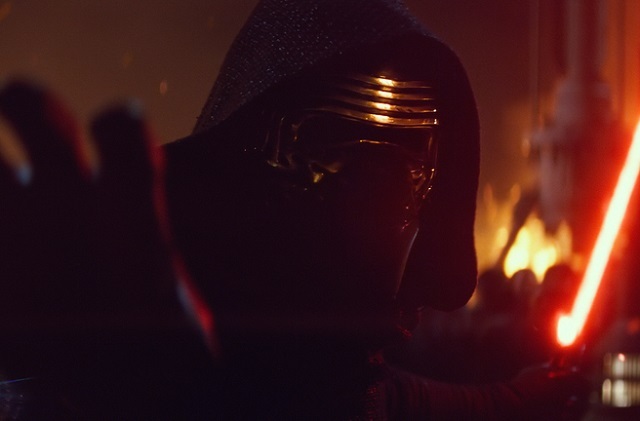 However, a hero needs a villain and The Force Awakens has an utterly compelling figure in Kylo Ren (Adam Driver). Though he appears to be the fearsome badass that Darth Vader was in the original trilogy, Ren doesn’t cut quite the same imposing figure. And that’s surely intentional. Is it because this is a sleeker, yet somehow less refined warrior? There’s far more to this character than his silhouette and outward appearance. To say anything more would be stepping into the spoiler territory I’m trying so hard to avoid. But his story could ultimately be the most intriguing of these new Star Wars films, and could eventually surpass Vader’s. As mentioned above, Abrams and Kasdan pay tribute to the original trilogy and as exciting as the new characters are, it’s the familiar faces that make this movie feel meaningful. This might be where keeping George Lucas at a distance pays off most. (His need to flood the screen with digital effects and make actors recite wooden dialogue in front of green screens is another matter entirely.) Since he originally created these figures, maybe he just doesn’t have the proper perspective on them or realize what they mean to fans and other creators. With a different view (or in Kasdan’s case, revisiting after some time away), Abrams builds on what was previously established, adding growth and depth to Han Solo and Leia Organa. Hell, even Chewbacca gets that loving treatment. There’s a whole backstory that has taken place since we last saw these characters, which is alluded to during the film. We’ll probably never get that whole story, but learn as much as we need to for the purposes of this new tale. Ford and Carrie Fisher slip back into their famous roles like they never left and it’s an absolute pleasure to watch. Everyone involved could have just leaned on visual reference — It’s Han Solo! Yay! — but these are fully realized characters given life. Everything in The Force Awakens feels right and true — and familiar, but in the best possible way. Abrams obviously had tremendous expectations to fulfill, and does not fall short. He gives us what we wanted, but the fan service isn’t lazy or cynical in any way. There is no placating here. This movie will warm your heart and lift your spirits, but it will also punch you in the stomach — just like the original Star Wars films did. And the whole thing leaves you wanting more, which is just about the best feeling possible for something so anticipated and hyped. You will be eager to see it again and again.